Let us ask ourselves – why are we here? Why are we here and why would we call ourselves Christians? What do we expect from our Christian identity, from being Christians? God’s protection? Sure. We truly receive God’s protection. There is no doubt about that. We are God’s family through the Christ and He takes care of His own. What else? That God will bless us? That we’ll have abundantly what we need? That we’ll have a good, peaceful life. All these are good expectations. Indeed, our Father in heaven is happy to pour out over us His generous gifts. Quite often we can experience God blessings as peace, prosperity and wellbeing not just for individuals, but for families, for communities, even for states. God can and do provides for us. Daily. Abundantly. We all are witnesses of incredible prosperity in our Western culture, prosperity which we can truly call a blessing from God the Father. What were Jesus disciples hoping for? Probably something similar. And they got it. Provision for their daily needs. Protection against all enemies. For no one could resist Jesus. Peace and joy from being in Jesus presence. Listening to His teaching, observing His mighty and mysterious deeds. To forget about all difficulties and struggles. This is how disciples felt together with Jesus. This is why Jesus words which we heard today didn’t make sense for the disciples. We don’t want this! We really don’t even want to hear about it. No hard situations, no confrontations, no sufferings, no sacrifices for the sake of someone else. For Jesus came to save us from all bad things. To bring us into His Kingdom on peace. Right? It is true. You are saved, you are forgiven, you are chosen, you are heirs of all God’s promises. What God has promised, He will not change. Ever. No one can take it away. The Kingdom of God is and will be yours. So let us focus on this good and blessed life. Let us be happy. Isn’t the pursuit of happiness the main goal of our lives? Aren’t we told so all the time? Peter said: “No, no Jesus!” Jesus answered: “Yes, yes, Peter!” Suffering, death and resurrection. This is why I am here. This is the way I’m going to save this world and to establish my Kingdom. By laying down my own life for the sake of the world. For each of you. As I said, it is good to desire peace and joy, wellbeing and security. And we’ll all have it, even to the extent which today we can’t even imagine. But Jesus didn’t come to ensure a good life for us here. He came to suffer, die and rise again so that we can have eternal life in God’s presence. We would like to think that becoming a Christian and being a Christian is about receiving God’s blessings. Forgiveness, peace, joy, live. And, of course, it is true. Our Father is heaven is happy to bless us in so many ways. He does it daily. But, this is not all. There is one thing we need to remember. Whenever this Triune God choses and calls someone to Himself to be blessed, and you all are here for you are chosen and called, it is not only for the sake of you, but also for the sake of others. We can say that we are called and blessed to be a blessing for others. Poor Peter, he must have been shocked. He meant it well. Sincerely. Not only He was rebuked and called Satan, but now Jesus invites, and invites with quite strong words to do something that neither Peter, nor other disciples, nor we are looking forward. Deny yourself, take up your cross and follow Jesus. As Jesus denied Himself and took His cross, also Christians are called to do the same. Not exactly the same, thanks be to God! But then what does it mean? To deny myself, to take my cross and to follow Jesus? How contrary to this notion sound Jesus words: “Deny yourself!” It is like abandoning the very center of our lives. In fact, this is nothing more than return to what we are created to be. We are created in the Image and likeness of the Triune God. Which means that we are His stewards, His representatives here on earth and we are supposed to act in a way that resembles our Creator. That is, living in sacrificial service to others. We can quickly look at two things that summarize well what it means, to deny yourself, to take your cross and to follow Jesus. Receive and  give. That’s it, receive and give. First, receive. We may wonder how could receiving be a cross? Let’s see. We are made children of God the Father is our baptism. It gives us new identity. The most precious, the most important identity. Christian. That’s who you are. This identity defines and shapes everything that we do. Not only our worship. Of course, this is a gift, infinitely precious gift, there is no way we could become chosen people of God on our own, but we also need to learn how to receive this gift properly. When we are made members of the divine family, we ought to live as members of this family. It requires our efforts. It means that everything we do we have to do differently. We need to look differently on marriage, what’s God’s design for it, on our parenting, what is God’s purpose for it, on our work, what is God’s will for it, on our friendships, on our citizenships, on our hobbies, on our possessions, on all dimensions of our life. We have to look at them and live in them as Christians. Besides, when we live as Christians, we also need to learn how to explain to others why we do this. What is our motivation. What is our identity. What does it means to be a Christian. This may sound as an easy thing, but in fact in means denying our desire to be in control, to be gods ourselves, to decide ourselves what is good and what is not, what we are going to do and what not. Instead, it means to deny ourselves and to listen what our Creator and Redeemer wants us to do. It is anything but easy. For it means we need to learn how to be Christians in all that we do, and to be able to share it with others. It means to be where God is present, where His word in read, studying what the Triune God speaks to us, struggling to figure out how to live out our Christian identity in our particular situations. It is pretty heavy a cross to take. For on this cross we need to crucify not someone, but the idol of self, our desire to live for ourselves. The amazing thing is that when we are in God’s presence, when we listen to Him, when we are shaped by His word and prepared for our mission, this gives us such a joy which we can’t compare with anything else. For this joy comes from the fellowship with the Father, the Son and the Holy Spirit. And at the same time it is so difficult to find a time to do it… everything else seems to be more important. We are made brothers and sisters of Christ, but if we don’t live accordingly it brings shame to all family. And this is what Satan will try to achieve by all means. To make us think about ourselves, not about others. It’s funny. Psychologists and counselors are today’s priests and wise man. And so often this is the mantra that they repeat. ‘Thing about yourself, think about yourself…’ No, if you want to be a Christian not only by name, but in your actions, deny yourself and live for others. Second, give. How do we deny ourselves and take our cross by giving? It is very down to earth. We all have many vocations. And by vocation we understand different relationships that imply different responsibilities. We are children of our parents, and parents of our children. We are siblings and we are spouses. We are employees and employers, we are friends, and so on. We should look at all these relationships or vocations as God’s gifts. Many of them are true blessings for us in so many ways. But at the same time, these relationships are the place where God has put us to deny ourselves and serve others. Sometimes it is not that difficult. If we think about our loved ones, it gives us joy to serve them trying to make their lives better. Be it in good marriage, family, friendly company, or elsewhere. And even this quite often requires to say ‘no’ to what we would prefer to do. But we live in this broken world. Our vocations quickly turn into a cross, when people in our lives are not nice at all. When to our service and care they respond with ingratitude, slander, intrigues, apathy. When they take for granted our care and faithfulness, but at the same time do quite the opposite. How quick are we to turn away from these people? How quick are we to exclude them from our lives? For why would we bother with these… who don’t deserve our attention and time. Let’s ask ourselves, how well are we doing with denying ourselves and taking our crosses? How well are we doing with receiving and with giving? How good are we living our lives as Christians? We know the answer. We fail. We fail in so many ways. We are happy to receive Lord’s blessings, but we are slow to take up our crosses. We want to focus on our lives, our wellbeing, and not on lives of others, and least of all on lives of those whom we don’t like. We don’t like them because of their words, attitudes and actions. But all the evil things begin in our hearts. Jesus, the Son of God sees our hearts. He knows what kind of people we are inside, He knows all that we hide from others. How likable are we to Him? But He still denied Himself for our sake. Those whom we don’t like are the most broken people. They need the love of Christ more than others. There is no other way they can experience Christ’s love and be transformed by it if not through us. Christ showed His love towards you by laying down His live. 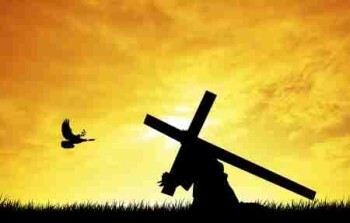 By denying Himself and taking His cross. Literary. Now He sends us to be little ‘Christs’ for others, so that though our self-denial they would experience at least a bit of this divine love. It is not an easy task. Not at all. That’s why Jesus calls it a cross. But He Himself also helps us in this task. By providing us with a motivation. Think about these words. For the Son of Man is going to come with his angels in the glory of his Father, and then he will repay each person according to what he has done. I want you to pay special attention to these words. He will repay each person according to what he has done. Remember, it is not about your salvation. You are saved. All your sins are forgiven. Jesus took care of them. Your are made a member of the divine family. Your name is written in heaven. Nothing will change it. You are God’s child. But when Christ returns, He wants to repay you for all the good that you have done serving others and testifying them about Jesus. Our crosses are not left without reward. We may not receive much of it here, even if we may have joy from following Jesus, but you will be fully rewarded when our God returns in His glory. Jesus suffered and died for us, for each of you, He rouse again to live forever. Why are we here? Why are we Christians? For we are called to receive God’s blessings, but also called to share His mission, to deny ourselves for others, to take our crosses, even if they involve sufferings. For our efforts will be rewarded when we inherit God’s Kingdom. ← School and Scripture: get excited? !